What’s Going On, Sutro Tower? We Built This City just piqued my Sutrocuriosity. I’ve had this weird feeling the past few weeks that something is different about Sutro, but wasn’t quite sure what. Here’s YBTC’s shot of Sutro on Diamond Heights over by Glen Canyon on Friday. One antenna… Two antenna… Whaaa? Something’s missing. WBTC provides an even more revealing picture from the Conservatory of Flowers in Golden Gate Park (to the north of Sutro). Using the power of Lumix 10x optical zoom, we investigate Sutro further, this time from the east. Luckily we have tremendous resources like the Sutro Tower page (sutrotower.org) to clear up these mysteries. Turning to their epic antenna diagram, we learn that the top three towers are being upgraded due to the digital TV transition. In fact, the top three antennas are analog-only and thus not even being used for TV, only a single radio station. All DTV signals are coming from the auxillary antennas in the middle. Behold the official Sutro Tower status diagram from sutrotower.com. The shorty in our picture (the “West Stack”) is currently being replaced. 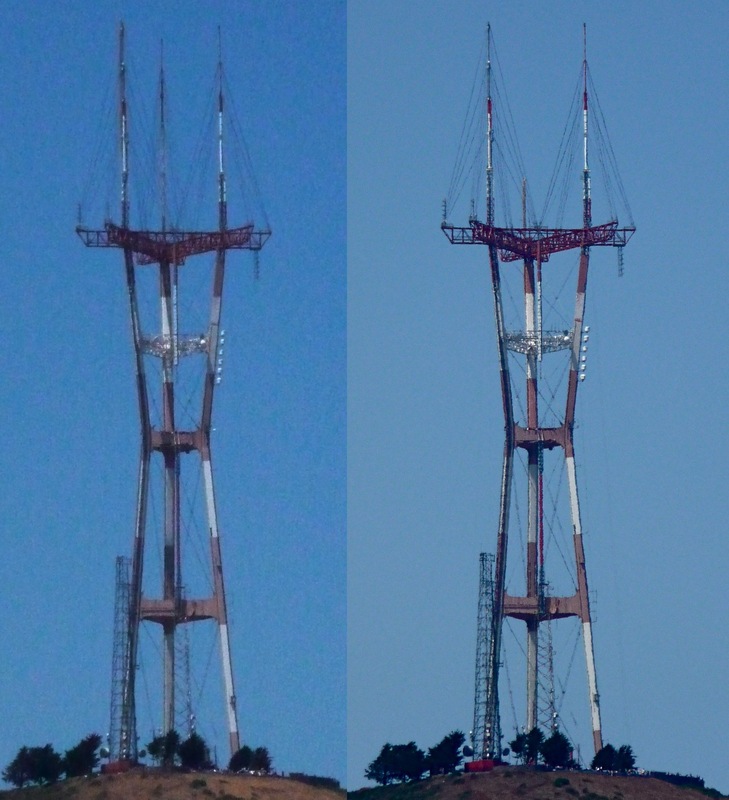 Fret not, Sutro Tower will regain its former symmetry soon after the other stacks (North and South stacks?) are upgraded to their full digital glory over the next few months, meaning even stronger HD glorious digital moving images. We Built This City also has some nice, dramatic shots of the bi-polar nature of fog and the Golden Gate Bridge. 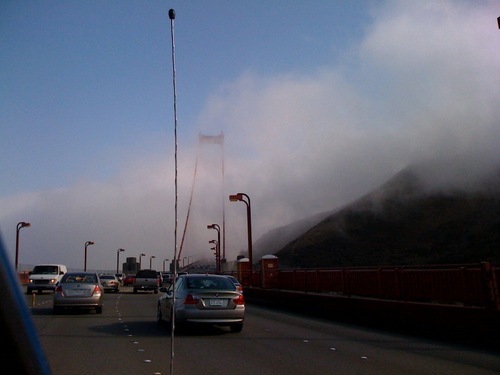 This is exactly what I remember from when I first drove across the bridge when I was 10. We we driving to Phoenix from Victoria (but in a yellow Honda Civic rather than a Mini…) We spent the night somewhere around Santa Rosa and got up ridiculously early. My mum woke me up when we were about to cross the bridge and said something along the lines of “You need to remember this.” A quarter century later, here we are. Someday you will have your own little bj network hi-def antenna up there. It will be the one with the itsy bitsy pirate skull & bones flag flying. If it pointed down to Dolores Park, hell yeah. I get crap signal there from our friends at at&t. (they don’t deserve capitialization). I’d also take 8 webcams that give 360 coverage. But they *would* have to have pirate flags. Is there a working webcam on Sutro now? Don’t think so but happy to be proven wrong. Thanks for the link. Interesting! That one shot of Sutro was from Diamond Heights Blvd. over by Glen Canyon, just FYI, not that it impacts your research. Thanks — just added your Golden Gate Park photo to the mix. Funny how it’s not all that noticeable from the Mission, yet incredibly obvious to the north or south of Sutro. Reordered the article as not to bury the lede as I am so fond of doing. BTW, that car in the shots on the GGB is a PT Cruiser, not a MINI. Good eye! Johnny0 probably knows that I own a Mini, but my friends rented an electric blue PT Cruiser (gag — not their choice!) during their visit, which is what we took up to Marin. Thanks for posting the link to that awesome 1973 article unveiling the Sutro tower (http://www.sutro.org/Pages/x6.html). 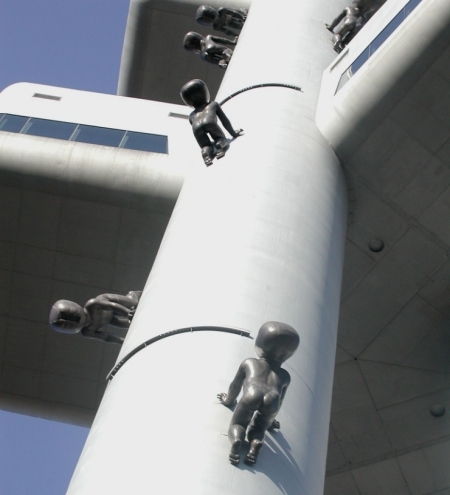 That has to be the most hilariously over-the-top article about a TV tower in history. I love how the tower itself is variously described as ‘mind-blowing’, ‘outlandish’, ‘sneering’ and ‘terrible’. Also, the false initial assurances that it would be painted a gentle wheat color. Great stuff! Great stuff here as always. I get fantastic DTV reception in the Mission and often wonder why I foot the bill for satellite. I’m also interested to see what happens w/ all of that whitespace leftover from the digital conversion. Anyone know what the latest is in the aftermath of that auction they had a while back? AT&T and Verizon are supposed to be starting trials in 2010. AT&T might actually jump above their 60% reliability rate! I’m just happy our friends at Google threatened to bid to ensure open access. Comcast = Jon Stewart + HBO/Showtime. But it really is absurd how much I am paying for cable. Thank you for the nice comment. I have lots of new information to post but since you mentioned it here, I went ahead and updated the internet cameras section. In short, there IS a camera on the tower but I do not know of a public way to access it… yet. In the meantime, you can see a picture of the camera’s monitor showing the view: http://www.sutrotower.org/#webcam I have included a link to this page as well since it nicely documents one portion of the visible changes taking place during the DTV conversion project. FYI, the same crew that is currently replacing the three spires on the Mt Sutro tower just finished replacing the VHF antenna on top of the KIRO-7 (CBS) tower in Seattle, WA. They removed the vertical ‘stick’ antenna which weighed 12,000 pounds (yikes) and added 4 additional tower sections, then side-mounted the new UHF antenna near the top of the altered structure. It was a 2-week job and very interesting to watch happen. Prior to the Seattle job they redid a tower in Florida, so these guys certainly get around! For those interested in looking at photos of the on-going antenna project on Sutro Tower, check out the Sutro Tower pages on my web site. I have been adding photos of the old antennas coming down and the new antennas going up, as the fog has permitted. The southeast and west masts are complete and work has begun on the northeast mast. KGO 7 is already using their new antenna atop the southeast mast. The UHF stations will change over to the new antennas when the project is complete. It’s scheduled to be completed about the end of October.